Last week I wrote about my Watford Waterstones event. 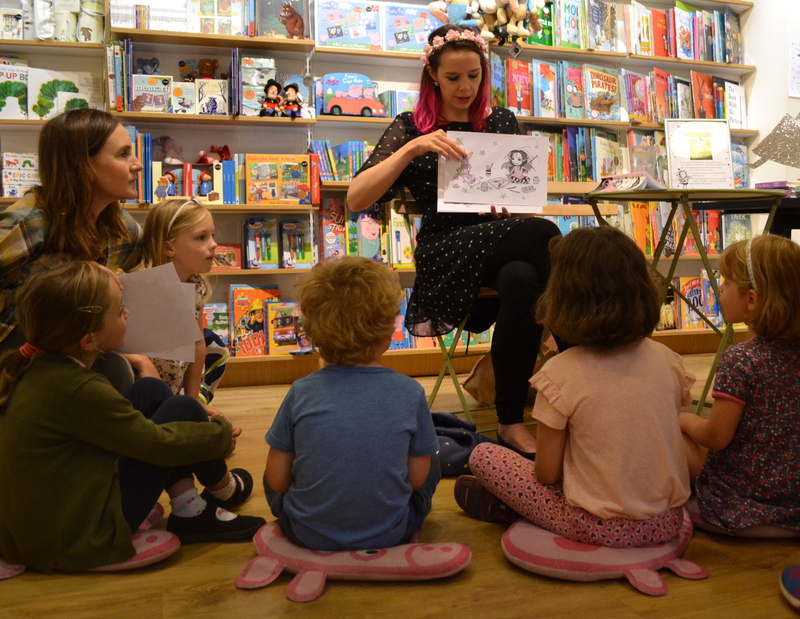 Yesterday marked the second weekend of my August Waterstones events to help promote Isadora Moon. Today I visited both the Welwyn Garden City and Hatfield stores. The staff at both shops were brilliant in promoting the events and we had a really good turn-out. As ever, it was wonderful to meet children who already enjoy the Isadora Moon stories, and to introduce my little vampire-fairy to some new people. We were still setting up the craft table when the first very punctual children started to arrive. They got straight down to creating some beautiful Isadora Moon artwork using the colouring sheets, sequins and glitter paper. I always love seeing the different ways children go about decorating the line drawings. Colouring in is hard work! This little girl was really pleased with this picture that she spent ages colouring in. When she was finished, she really wanted me to have it as a present. I’ve added it to my special folder where I keep the letters and pictures from children who have enjoyed my books. After colouring, it was time to sign some books. I love hearing about which books the children enjoyed the most and why. Sometimes they ask me which my favourite is. Obviously I love them all, but I especially like Isadora Moon Goes Camping for the funny parts, and Isadora and Mirabelle shrinking themselves to play on the dolls’ house slide in Isadora Moon Gets in Trouble. This girl wore special black lipstick and was really happy to have her book signed. Part of the introduction involves a game of feeling some of Isadora Moon’s favourite objects with eyes closed. This little boy did admirably at guessing what Isadora wears on her legs, getting very close with both ‘leggings’ and ‘trousers’. To be fair, he had never worn tights before. Down the A1 to Hatfield! Before I knew it, I was heading down the A1 to the second of Waterstones events, at the Hatfield Galleria. Last time I was here for an event, I did a picture of Isadora Moon for their display. They’ve left it up since, which was handy to promote today’s event! Laura is also an illustrator, which is how I know her. We did our Art Foundation course together at the University of Hertfordshire eleven whole years ago. You can buy the book she illustrated on Amazon. Her, and her colleague’s promotion really paid off, because there were two fans who had turned up extra early. A couple more fans were disappointed to not be able to make the event, but had left copies behind the till for me to sign. One difference I noticed between the Welwyn and Hatfield Waterstones events was in the people coming over to the event area. In Welwyn, just about everyone there had come specially for the Isadora Moon event. I don’t think there was anyone who just happened to spot the event while they were in the shop. Some of the children at Hatfield had come there specially, but there were quite a few who saw there was an event on, came over, and learned about Isadora Moon for the first time. Several of these bought copies and were excited to have them signed. I hope they enjoy reading about her adventures. All in all, I thoroughly enjoyed my events today. Thanks to the Waterstones staff for supporting and making them both successful. You can see what events I have coming up by visiting my Upcoming Events page. Next weekend is the last of my Hertfordshire August Waterstones events. I’ll be visiting the St. Albans and Harpenden shops. After that I’ve got a little break from events, then I’m up in the East Midlands at the Derby Waterstones on September 16th. I hope you can make it to one of my events, if you haven’t already. Finally, if you haven’t already, please think about signing up to the mailing list for the Isadora Moon newsletter. The Isadora Moon party pack is going out this week, so sign up for a digital booklet of ideas for games, food, costumes and decorations to host your own Isadora Moon party. The newsletter will be out roughly once a month, and contain the latest Isadora Moon news as well as activities and other cool things.